On the occasion of the World Oceans Day, Blancpain and its President & CEO, Marc A. Hayek, are proud to unveil the world premiere of their third series of Blancpain Ocean Commitment (BOC)limited edition diving watches. By purchasing one of these 250 timepieces, each client contributes to Blancpain’s participation in the cause of ocean protection. 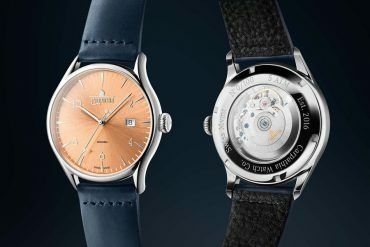 The brand commits to donate 1,000 euro for the sale of each watch, implying a total of 250,000 euro added to Blancpain’s much larger support. 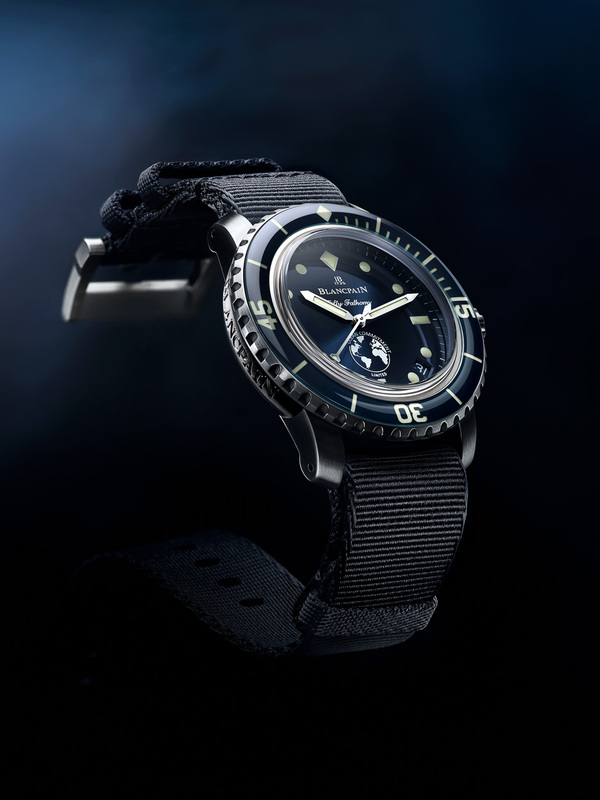 Since the launch of the Fifty Fathoms – the first modern diving watch – in 1953, Blancpain has maintained an unfailing commitment to exploring, preserving and achieving a better understanding of the world’s oceans. During the past 65 years, this dedication has been intensified and diversified through multiple partnerships. 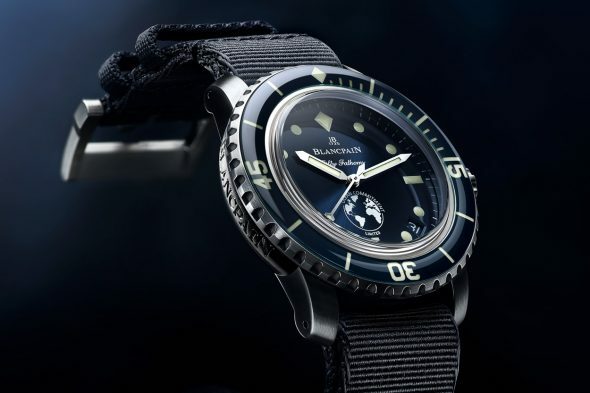 Four years ago, in addition to Blancpain’s annual support to expeditions and major oceanographic projects, the brand introduced a first series of limited edition BOC timepieces. 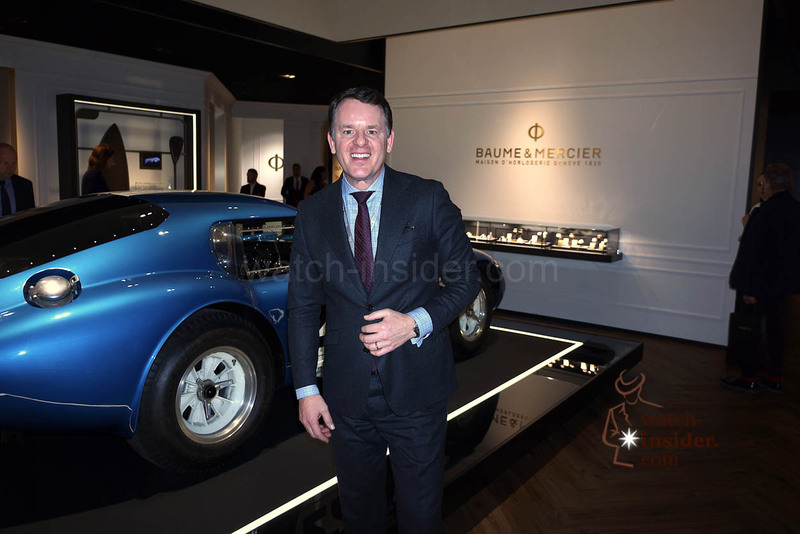 Following the success of this watch and the positive message it conveyed, the Manufacture extended this initiative in 2016 and is now unveiling the third BOC timepiece. The Fifty Fathoms Ocean Commitment III features the main characteristics of the 1953 model, which has defined the finest diving watches for the entire watchmaking industry ever since. Loyal to the DNA of the original watch, the BOC timepiece houses a reliable and robust self-winding movement, caliber 1151, which achieves a four-day power reserve. The balance is fitted with a silicon hairspring, a material insensitive to magnetic fields. The movement is protected without need of an inner soft iron case, which was the solution used in the past. 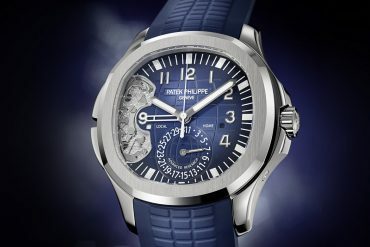 The case is equipped with a transparent sapphire case-back affording clear views of the movement’s fine Côtes de Genève decoration, as well as of the gold winding rotor specially engraved with the inscription “Ocean Commitment” and featuring a NAC finish (an alloy notably composed of platinum). 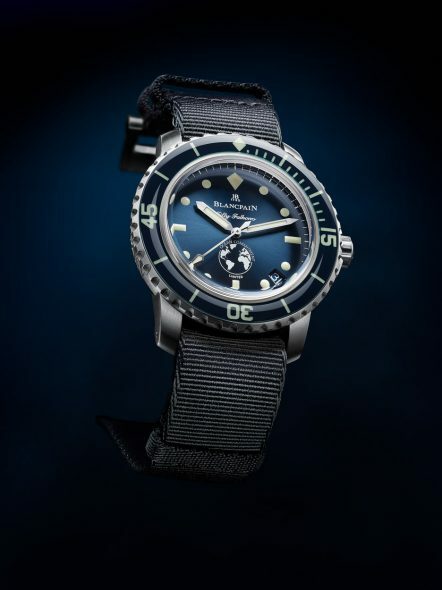 The timepiece is water resistant to 30 bar, equivalent to approximately 300 meters, and has a unidirectional rotating bezel, a must-have for a diving watch. 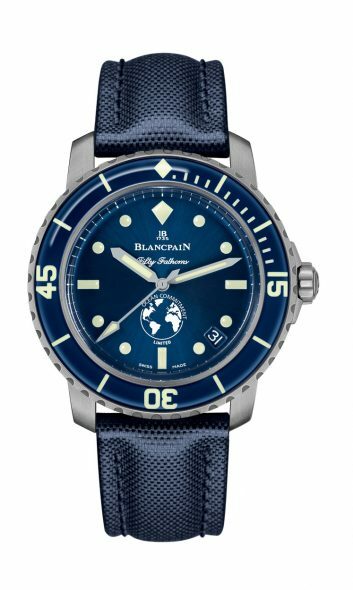 Blue in color as a reference to the oceans, the bezel is topped by a scratch-resistant sapphire ring, an innovative feature introduced by Blancpain in 2003. Its large indexes are in Super-LumiNova®, as are the dial’s markings and hands, thus ensuring optimal readability in underwater conditions. The deep blue color used to fashion the bezel is also found on the dial of this limited- edition timepiece bearing the BOC logo at 6 o’clock. 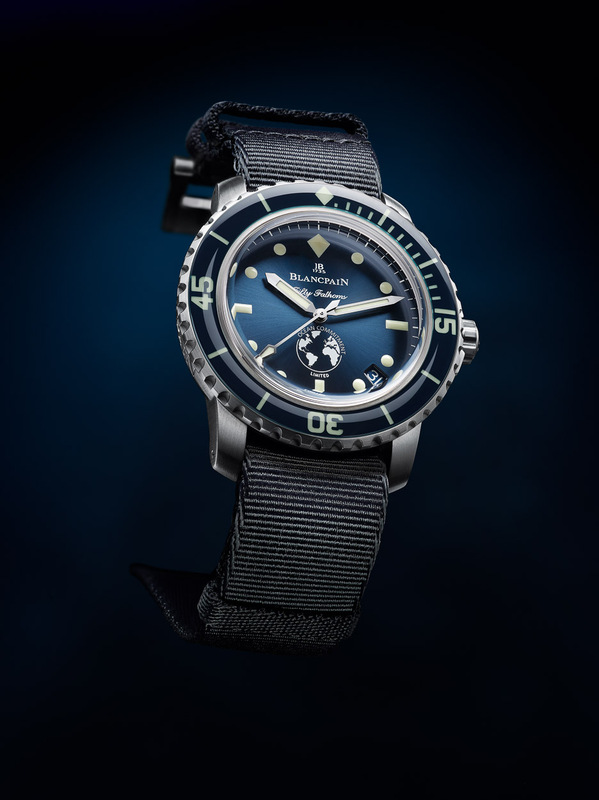 The new Fifty Fathoms Ocean Commitment III is offered in a 40 mm-diameter satin-brushed steel case, an exclusive diameter reserved for limited-edition Fifty Fathoms watches. It is delivered on a sail-canvas strap and comes with an additional NATO strap, both matching the color of the dial and the bezel. The 250 watches of this special BOC series will all be individually numbered. Each client will receive a corresponding hand-numbered copy of the Edition Fifty Fathoms book, which is celebrating its 10thanniversary this year. This landmark edition is composed of stunning black & white underwater photographs printed on pages bound with removable screws, thus enabling the owner to extract a selected page and place it within a picture frame supplied with the book. 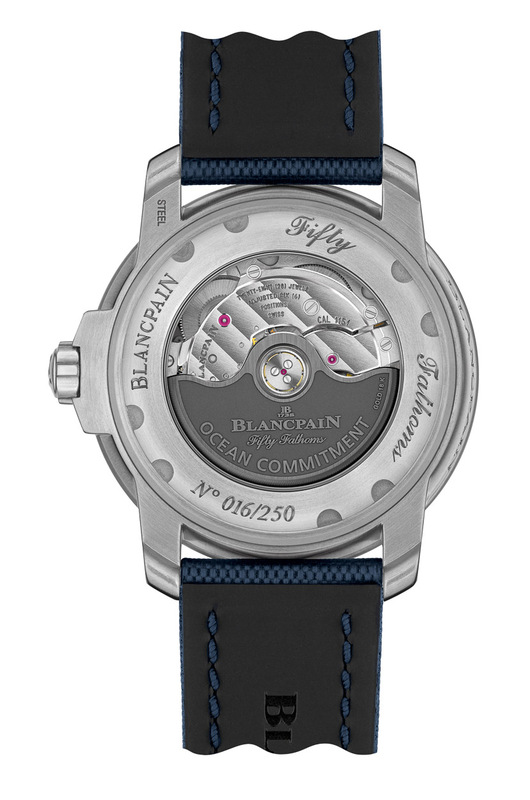 The purchase of a Fifty Fathoms Ocean Commitment III timepiece also entitles its owner to membership of the Blancpain Ocean Commitment Circle, giving access to exclusive advantages including invitations to private BOC events and conferences regarding ongoing scientific expeditions financed by Blancpain. 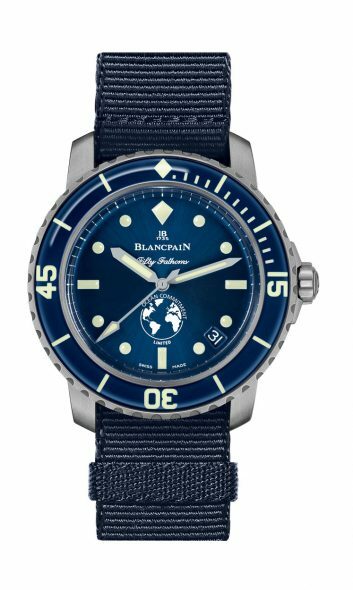 For more info visit Blancpain. Special Note: Limited Edition of 250 pieces. Cool or not cool? 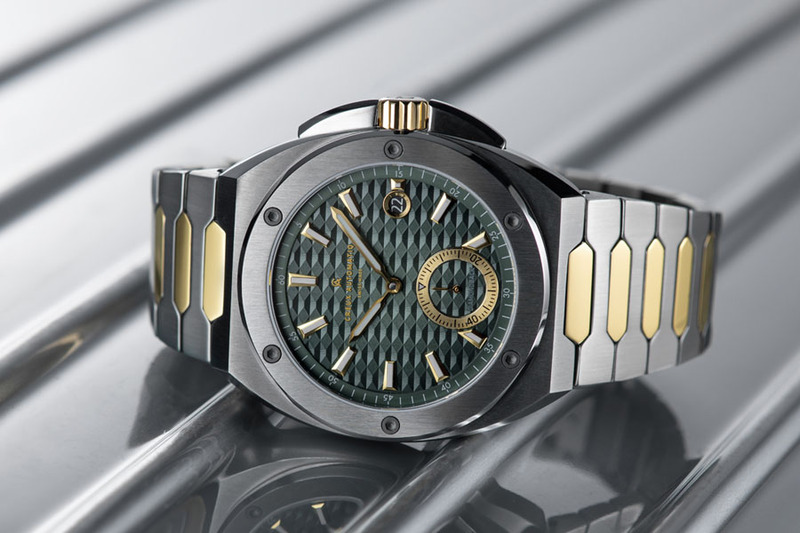 Bamford Watch Department and Blaken changing the look of iconic models. How far should individualization go?